Check out the application for the specifics on the activities in each of the four categories. In addition to the activities listed in the table portion of the application, a school may design and propose another activity, listed as “other”, which may qualify toward an environmental designation. Important Note: All alternate activities listed as "other" must be approved by your Michigan Green School County Coordinator by December 1, 2018. All applications are due March 1, 2019. 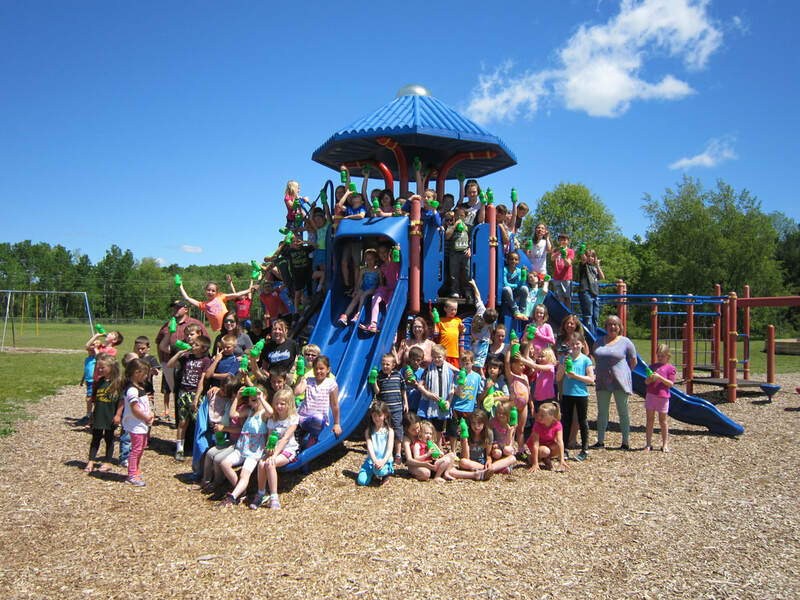 Rapid City Elementary, Kalkaska Public Schools, show off their Michigan Green School reusable water bottles. Michigan has a newly funded bill to boost recycling in the state. It includes brownfield projects as well as new recycling initiatives. Invite your local legislator to talk to your school about it. Have a parent chaperoned walk to school day once a week for the environment and great exercise for the kids. Have a poster campaign to stop car idling in the parking and unloading areas. This will keep air much cleaner around school and save parents gas money too. 360 million printer cartridges still go to landfills each year. Make sure to have a collection box for them. Partner with your local library and put one there and collect once a month. You will find most libraries are eager to participate. There a number of companies that pay schools for the empties. Just do a keyword search to find them. Working with administration, find a tree species and location in your area to plant a tree in the spring or early autumn. Students could put a plaque at the base. Seniors could make their gift to school. Serious about reducing plastic bottle waste? Eco clubs should visit the Hydration Nation website. Another eco step is buying school cafeteria eggs and other packaged items in cardboard, not styrofoam containers. 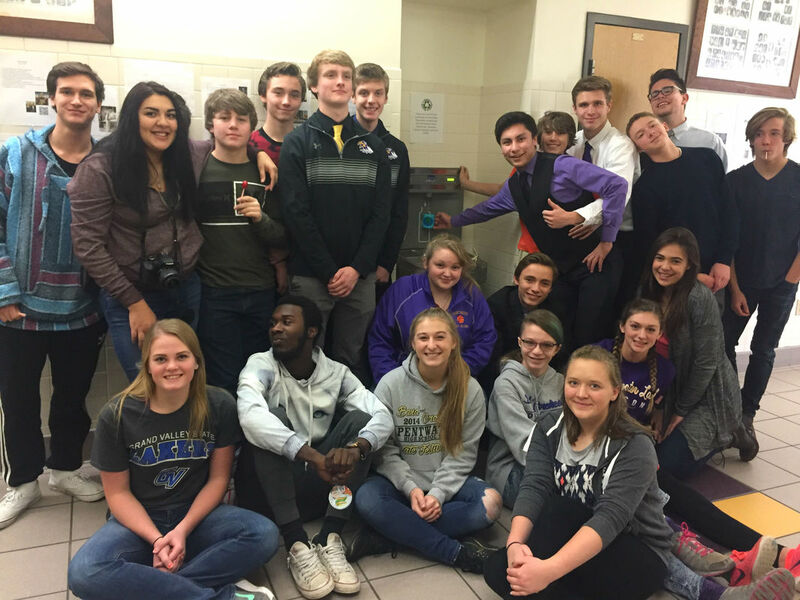 Pentwater Green Schools Club next to their new water bottle filling station. As students refill their bottles, the station provides a running estimate of how many water bottles are being kept out of landfills. Have a poster contest promoting new ways to recycle items like markers​. ​Learn more about our declining bat population. A virus called white nose syndrome has wiped out colonies in some states. One bat eats as much as 3000 mosquitos making them valuable to our public health. The Cranbrook Institute in Rochester is a great source of information and visuals. Go online to learn how to make a bat house. Have students contact their local government offices and see what they are doing to protect the local environment. For example, the city of Saginaw is installing led lights in town. Many towns are instituting plastic bags bans. What is your town doing? Plan for installing a rain garden which protects Michigan groundwater and streams. This is very popular in western Michigan. Host an old towel and fleece blanket drive. 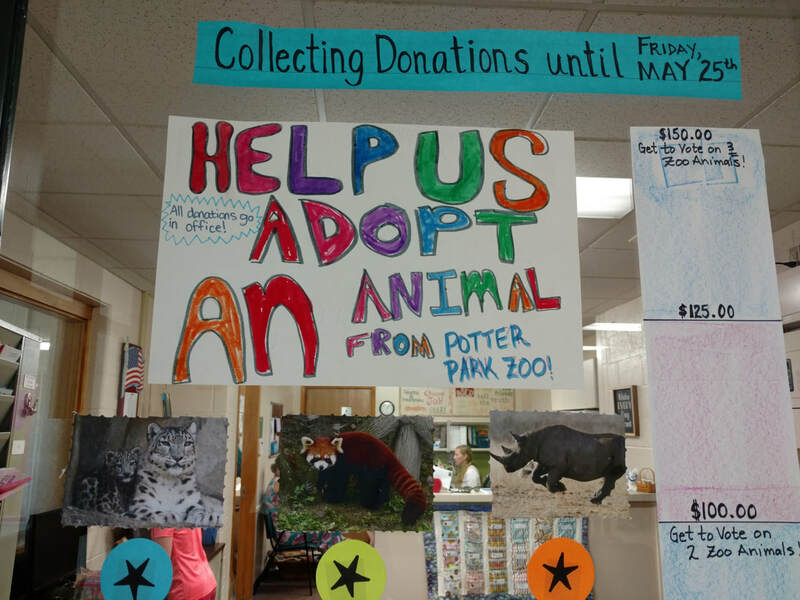 Our animal shelters need these items consistently. Check-in with your town's shelter to drop off these items. Bring old carpet cut into squares so animals dont have to sleep on cold concrete floors. Plan your garden with native Michigan plants. All of the plants listed below support Michigan wildlife and our falling bee population. Above all, make sure that your garden is pesticide free for the health of students, to protect the bees, and other creatures. Dill will bring in Yellowtail butterflies. Host a speaker to talk about ways to protect our seriously declining honey bee population. It has dropped by over 30%! Bees are necessary to pollinate so many of our crops. Check to see what state and local agencies are hosting bee protection seminars. Design a bee information bulletin board like the Goens Learning Center in Van Buren County. Dexter Elementary has created a beekeeping club! Adopt an endangered animal. Many schools vote on what animal they will ceremonially adopt from The Defenders of Wildlife, World Wildlife Federation, local nature center, or other worthwhile organizations that can be found online. The school receives a picture, a stuffed animal to display, and a certificate of adoption! 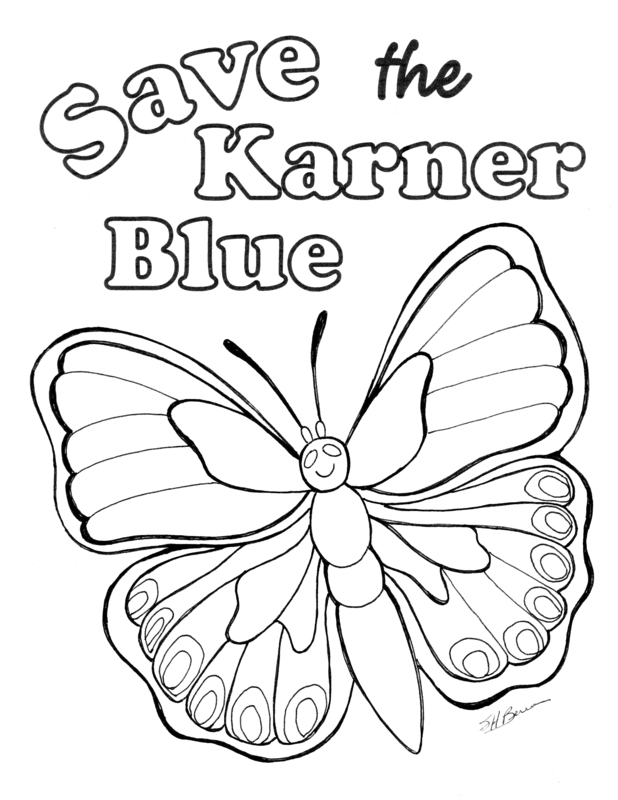 Raise awareness of the federally endangered Karner Blue butterfly by printing out this 8.5" x 11" coloring sheet for children to color. Read more about the Karner Blue in the Michigan Wildlife Awareness sidebar on our About Us page with more ideas for activities. Save the Hawk coloring sheet. An accurate coloring chart is also available by visiting the tool bar under more... on this website. Schools can also discover a number of Michigan threatened and endangered species by looking at the book, Fly Over Michigan. There are coloring pages with an accurate coloring chart for Kirtland's Warbler, the short eared owl and others. The book is available on amazon. Mooneye Fish coloring sheet with accurate coloring chart instructions. Save the Indiana Bat! Coloring sheet with accurate coloring chart instructions. Fun Ways to Earn Points! Many Michigan Green Schools are developing waste free lunch plans. This saves the school money, student calories and keeps the most harmful greenhouse gas, methane, at lower levels. The trumpeter swan is a threatened species in Michigan. These swans are often confused with snow geese and mistakenly shot by hunters. 1,300 trumpeters have died in the United States from lead poisoning when they ingest lead shot and lead sinkers in ponds. Highland Pines School in Caro, Michigan made a donation to The Trumpeter Swan Society. 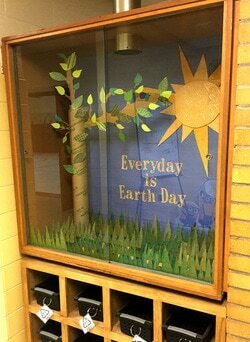 Peach Plains Elementary School, Grand Haven, put up an environmental information display using repurposed materials. These displays keep the school up to date and motivated. Have a small compost jar in your classroom for fruit scraps and put them on the school shrubs. It makes a great fertilizer. During Earth Week have a plastic bottle free day. Paper or glass is a much healthier alternative. 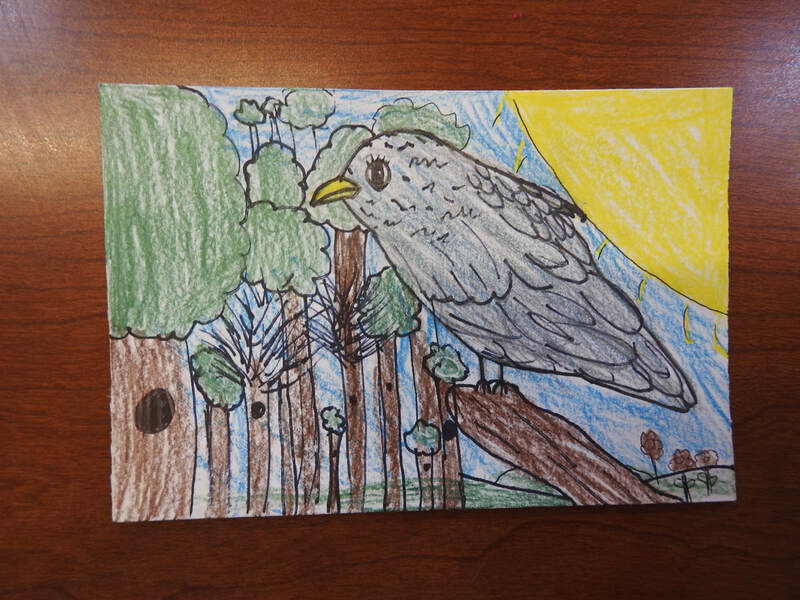 ​Encourage students to join the Great Annual Christmas Bird Count. Get details online. 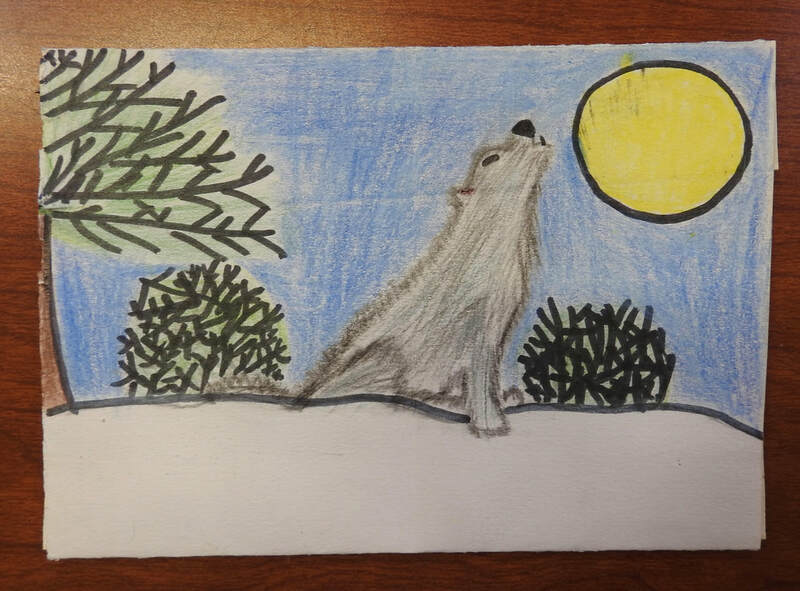 Eagle Creek Academy students made a set of Green School note cards of endangered Michigan animals.